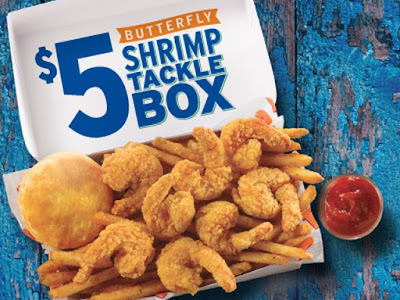 The $5 Butterfly Shrimp Tackle Box is back at Popeyes for a limited time in 2019. The combo meal includes crispy-fried eight butterfly shrimp, a side, and a biscuit, plus your choice of dipping sauce (including cocktail sauce and tartar sauce), for $5. Popeyes tends to offer the $5 Butterfly Shrimp Tackle Box each year around this time although it arrived slightly later this year due to the similar Southern Butterfly Shrimp that was offered for a limited time starting mid-February. They're also offering the $5 Surf & Turf combo, which includes two chicken tenders, four butterfly shrimp, a side, and a biscuit.